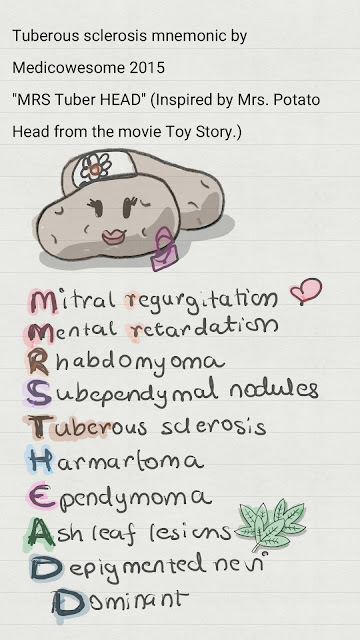 Tuberous sclerosis makes me think of tubers. Tuber is a plant structure that stores nutrients. Like sweet potatoes. And you know who it reminds me of? Mrs. Potato head from Toy Story! "MRS. Tuber HEAD" is your mnemonic! Another mnemonic that people use is the word, "HAMARTOMA" itself but it misses out Ependymomas and Depigmented nevi. PS: Tuberous sclerosis is also known as Bournville's disease.